Human CD16b (NA2), His Tag (SPR & BLI verified) (CDB-H5222) is expressed from human 293 cells (HEK293). It contains AA Gly 17 - Ser 200 (Accession # O75015-1). The NA1 form of the CD16b differ with the NA2 form of CD16b in AA36, 65, 82, and 106. The NA1 form carries R36, N65, D82, and V106, while the NA2 form carries S36, S65, N82, and I106. The protein has a calculated MW of 22.7 kDa. The protein migrates as 38-50 kDa under reducing (R) condition (SDS-PAGE) due to glycosylation. 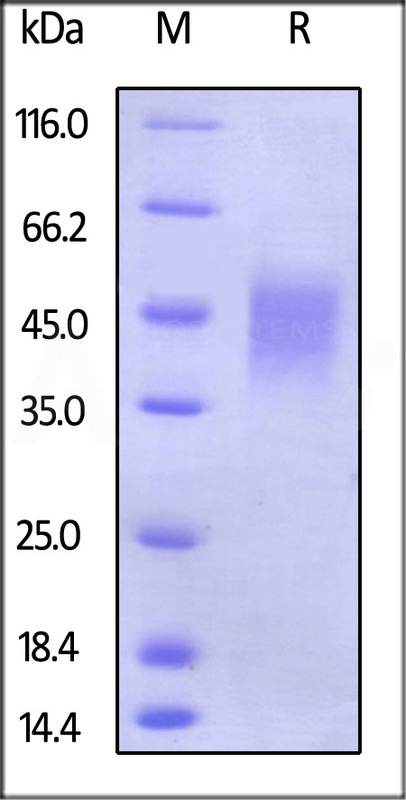 Human CD16b (NA2), His Tag (SPR & BLI verified) on SDS-PAGE under reducing (R) condition. The gel was stained overnight with Coomassie Blue. The purity of the protein is greater than 95%. Immobilized Human CD16b (NA2), His Tag (SPR & BLI verified) (Cat. No. 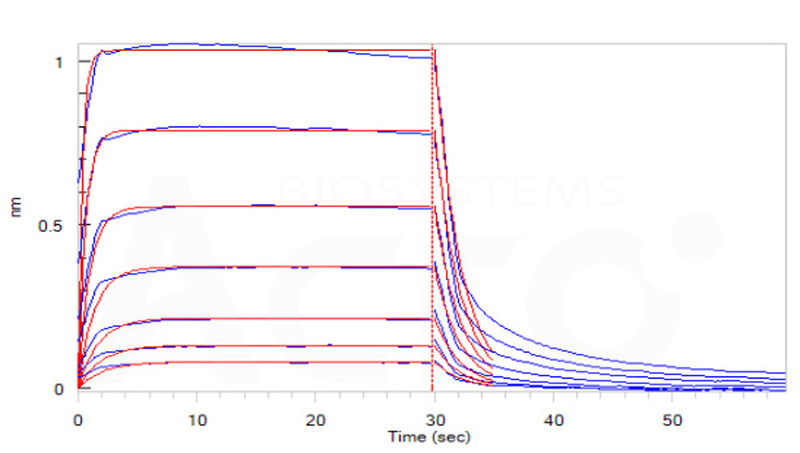 CDB-H5222) on CM5 Chip via anti-His antibody, can bind Rituximab with an affinity constant of 2.88 μM as determined in a SPR assay (Biacore T200) (QC tested). Loaded Human CD16b (NA2), His Tag (SPR & BLI verified) (Cat. No. CDB-H5222) on HIS1K Biosensor, can bind Rituximab with an affinity constant of 7.1 μM as determined in BLI assay (ForteBio Octet Red96e) (Routinely tested). CD16 is a low affinity Fc receptor, and has been identified as Fc receptors FcγRIIIa (CD16a) and FcγRIIIb (CD16b). These receptors bind to the Fc portion of IgG antibodies. CD16 encoded by two different highly homologous genes in a cell type-specific manner.CD16 is found on the surface of natural killer cells, neutrophil polymorphonuclear leukocytes, monocytes and macrophages. CD16B is also kown as FCGR3B and FCG3B, is expressed specifically by polymorphonuclear leukocytes (neutrophils) and stimulated eosinophils. CD16B is the low affinity receptor for the Fc region of immunoglobulins gamma. FCGR3B binds complexed or aggregated IgG and also monomeric IgG. Contrary to III-A, FCG3B is not capable to mediate antibody-dependent cytotoxicity and phagocytosis. CD16B may serve as a trap for immune complexes in the peripheral circulation which does not activate neutrophils. (1) Ravetch J.V., et al., 1989, J. Exp. Med. 170:481-497. (2) Gessner J.E., et al., 1995, J. Biol. Chem. 270:1350-1361. (3) Bux J., et al., 1997, Blood 89:1027-1034.